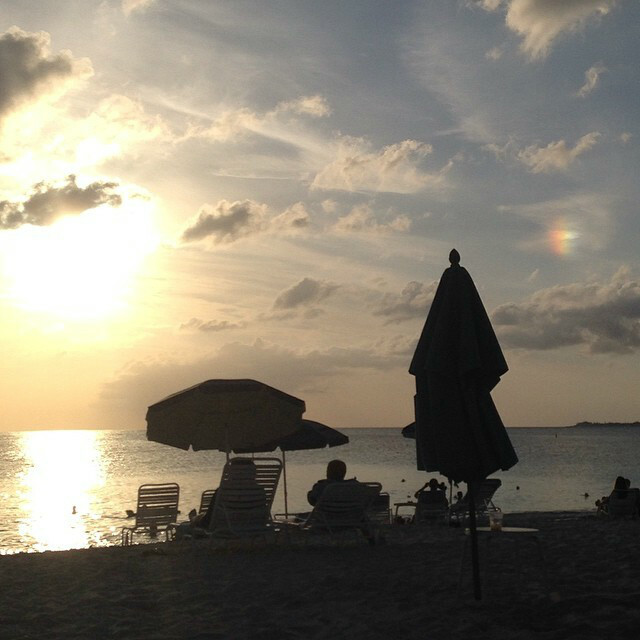 Grand Cayman is a beautiful sun-kissed island, with crystal clear waters and white-sand beaches. Though the season I ventured to the island (late May to early June) is considered the beginning of hurricane season, I actually believe that this is the better time to go when traveling to the island on a budget. The Grand Cayman is very comparable to European cities — it is very expensive. So going during an off-peak time will save you money on hotel and air costs. That is why I have created a list of places to venture that are worth the extra dollar and give you a bang for your buck. 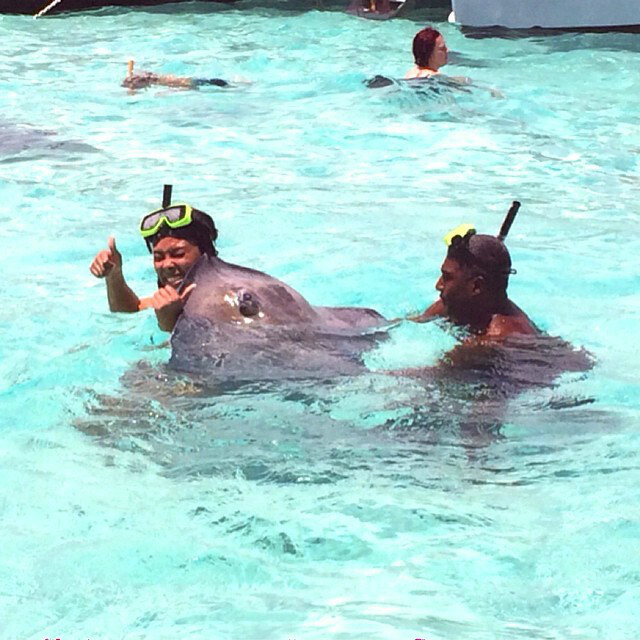 Stingray City is a must-do! This famous location (near Rum Point) is known for its high concentration of friendly stingrays. Even the most hesitant/fearful of travelers will soon notice that there is nothing to be afraid of, and that these spectacular animals are worth cozying up to. I recommend Captain Marvin’s 3-stop tour. I found Captain Marvin’s was the most suggested tour group by locals, and it was less than $50 for an adult. This tour included time at Stingray City, and two (very different) coral reefs. Additionally, Travel Agents receive a 20% discount (for the card holder). Also, the people in my group who paid in cash received a 10% discount. Note: Many of the hotels offer a package using Red Sail. This group is typically twice the amount of Captain Marvin’s and the only real difference I noticed was that Red Sail uses a large catamaran. Getting a kiss at Stingray City. Eats Cafe is the perfect breakfast location for those looking for a filling meal on a budget. The location is also connected to a sports bar, which has a solid selection of lunch and dinner options. Though I wouldn’t say that it’s an award-winning meal, I would note that it’s a very solid option and I had no complaints. Going back and forth between two common hotel options: The Westin Grand Cayman Seven Mile Beach Resort & Spa, and The Marriott Grand Cayman Beach Resort? Go with The Westin. Not only does this resort have the largest beach on the island and a big pool area, but its spa also offers all guests complimentary access to the sauna, steam room and hot tub. The Marriott’s spa does not have such amenities on the property. 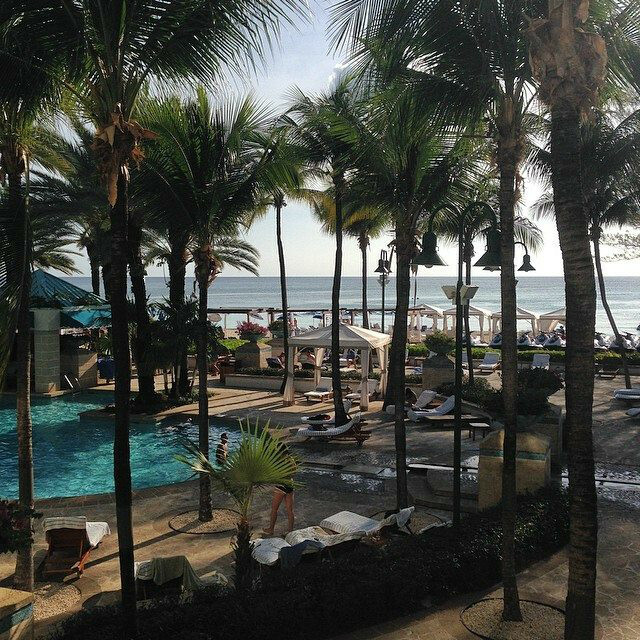 Additionally, The Westin has multiple dining options — including a beautiful beach-front restaurant. These establishments are even listed in the guidebooks that the Marriott gives to visitors.However, if you are a big snorkeling fan, the Marriott’s waters offer a cozy area, which is always filled with colorful fish. View from an ocean-view room at the Westin. If you plan on frequently leaving the resort to explore the island, rent a car. Living in places like Chicago and New York City, I have learned to strongly lean on public transportation. Though the buses are very solid options if you’re just taking a day trip to Georgetown (about $2.50 per person each way) they do not run long into the night, and can cost more depending on the destination. Also, the taxis are unbelievably expensive. For instance, I took a cab approximately 1.5 miles and paid $11 USD for a four-minute ride. Even in cities like NYC (barring traffic) this ride would cost about $5-$8. If that’s not enough of a reason, I was given quotes of $25-$50 each way for places like Rum Point from Seven Mile Beach. Renting a car is a much better way to travel about the island, and there are numerous free parking options. Make a reservation at Rum Point restaurant when going to Rum Point for dinner. This dining option includes a complimentary ferry to Rum Point — savings island-goers transportation fees and time. Sunset from Seven Mile Beach. How To Get There: Owen Roberts International Airport (GCM) is less than two miles from downtown Georgetown, the capital of the Cayman Islands. The airport is served by over 10 domestic and international airline carriers such as American Airlines, JetBlue Airways and United Airlines. The most convenient way to get to your hotel is by taking a taxi (unless you’re renting a car), which will cost anywhere from USD$16.80 to USD$75, depending on your hotel’s location. A complete list of taxi fares and restrictions are available here. More information regarding area transportation is available here. Best Time To Visit: Price wise, the period with the most expensive hotels and airfares is the high season, between mid-December and mid-April. It’s typically dry and the winds will typically help cool the high temps. If you’re looking to save, and can weather the high heat, consider visiting between late-April and May, where hotel prices can be up to 50 percent less than the high season. And while it may rain heavily during this time, it tends to be short, and is followed by clear skies and sun. Hurricane season is from June to November, and those are the times to avoid Grand Cayman if you don’t want to have the possibility of having your vacation disrupted.